For dedicated biomass combustion to become a major source of electricity, higher-efficiency conversion is required. 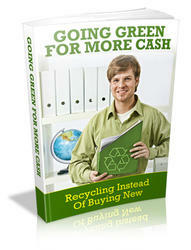 The best means of achieving this may well prove to be biomass gasification. 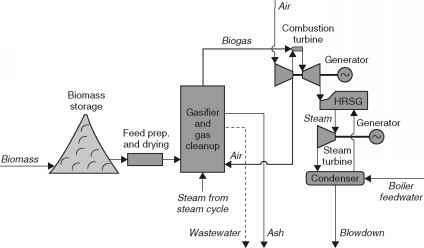 Gasification involves the partial combustion of biomass in either air or oxygen to produce a gas that contains combustible organic compounds, carbon monoxide and hydrogen. The gasification process is well tested and the product gas will have a calorific value of between one-fifth and one-half that of natural gas. This is sufficient for it to be burned in a gas turbine to generate electricity. the turbine is used to raise steam for a steam turbine which generates additional power. 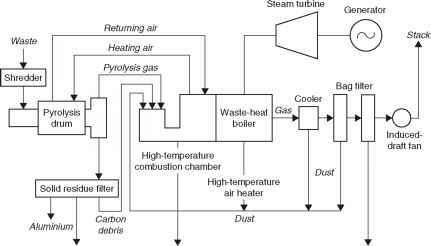 Any remaining low-quality heat that cannot be used for power generation is utilised for fuel drying and fuel heating in the input stages of the plant. With this type of configuration an overall fuel-to-electricity conversion efficiency of 45% should be achievable. An alternative approach is to use the biogas in a fuel cell. Modern, high-temperature fuel cells are capable of burning the chemical components of the biogas. While this might potentially offer even higher efficiency, perhaps 50%, the fuel cell technology is not yet commercially available.